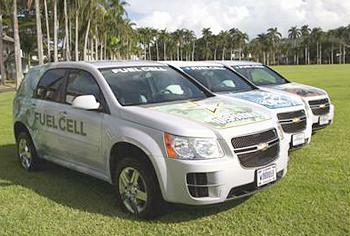 HONOLULU, Hawaii, March 1, 2012 (ENS) – The U.S. Army, Pacific is testing a fleet of 16 hydrogen fuel cell vehicles to research efficient, clean and renewable energy sources and reduce the military’s dependence on petroleum products. 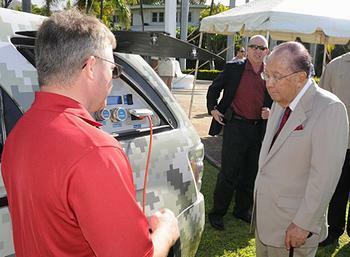 During a February 22 commissioning ceremony at Fort Shafter, Hawaii, officials from four U.S. military services – U.S. Army, Pacific, U.S. Pacific Fleet, U.S. Pacific Air Forces and U.S. Marine Corps Forces, Pacific – demonstrated the use of the 16 General Motors hydrogen fuel cell vehicles. Government leaders in attendance included the venerable U.S. Senator Daniel Inouye, 87, the most senior member of the U.S. Senate and the president pro-tempore, as well as Hawaii Lt. Gov. Brian Schatz and Honolulu Mayor Peter Carlisle. The zero-emission vehicles are being tested in Hawaii’s ideal climate for real-world conditions reflecting the differing needs of each of the four military services. “Once the key hydrogen infrastructure elements are proven in Hawaii, other states can adopt a similar approach,” said Charles Freese, executive director of global fuel cell activities for General Motors, a founding partner of the Hawaii Hydrogen Initiative. Fielding of military fuel cell vehicles with the Army, Navy, Air Force and Marines is the latest effort of the Hawaii Hydrogen Initiative, a partnership among 13 agencies, companies and universities launched in December 2010. In Hawaii, where every drop of fuel must be shipped in from thousands of miles away, the Hawaii Hydrogen Initiative aims to displace petroleum imports by operating vehicles with renewable hydrogen. “The military is paving the way, demonstrating the practicality and applicability of this technology,” said Freese. The military fleet of hydrogen fuel cell vehicles is funded by the Army Tank Automotive Research Development Engineering Center, Office of Naval Research and Air Force Research Laboratories. Headquartered at the U.S. Army Detroit Arsenal in Warren, Michigan, TARDEC is the central laboratory for advanced military automotive technology. The 16 fuel cell vehicles in the test fleet travel up to 200 miles on a single charge, refuel in five minutes and produce zero emissions. Each branch of the military is evaluating the vehicles in real-world use. “The test data collected will be analyzed to make fuel cell technology practical in future operational platforms,” said James Muldoon, science officer, U.S. Army, Pacific. “Our pursuit of alternative energy is closely tied to our commitment to continually adapt to an ever-changing security environment,” said George Ka’iliwai, director of Resources and Assessment for U.S. Pacific Command.